What's a May Day basket? I mean, I can see what it is from the picture, but what do you do with it? Melbert your basket looks nice. I guess those once are lollypops. So who is going to eat them ???? When I was growing up, it was a big deal to make all your friends May Day baskets with fun little candies, etc. in them. You'd go around delivering them, or take them to school. It was great fun to see who could be the most creative. Oooh, that's a really sweet idea. 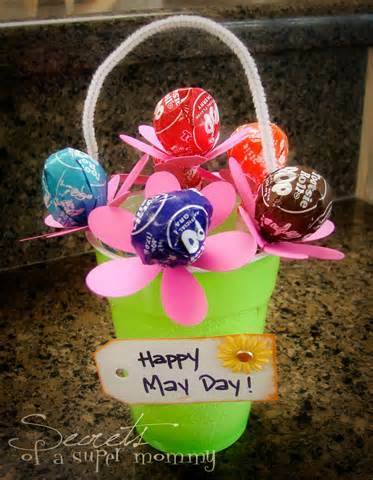 The May Day baskets are a lovely idea. I've never seen one before. When I lived Hertfordshire I used to go to the local May Day celebrations and enjoyed watching people dancing round the Maypole and also the Morris Dancers all dressed up with their jingly bells while they dance. In Edinburgh my friends and I used to walk up Arthur's Seat to watch the sun rise and wash our faces in the morning dew. This was supposed to give you everlasting beauty but it isn't working for me, unfortunately. On one occasion there was a student's Ball the evening before and a number of the reveller's walked up the hill in their ballgowns after the Ball was over. born this morning, Saturday 2 May, at 8.30am. First bit of news that I heard this morning when I got up. CONGRATULATIONS to William and Kate. Congratulations to William and Kate on the birth of their daughter. I understand they are just about to leave hospital. I hope Prince George enjoys having a baby sister. There is a lot of speculation about what the baby will be called. Will it be a modern name like Beyonce or Rihanna, Madonna or perhaps GaGa or Kylie? What about Princess Amal to go along with Prince George! Actually I'd quite like Elizabeth to be one of her names. Unlikely: Alice Keppel was a notorious mistress of the king a while back. Not sure that would be approved. mmhh ok...I guess it will be an old fashion Name in order to match it with George. Something fency would sound weird. .. will be so interesting. Can't wait for the Name. Charlotte Elizabeth Diana. What a beautiful name. Welcome like one! Great Name. I like Charlotte. I was wondering why the second name is Elizabeth and the third name Diana. Did they wanted to be "politically" correct because of Queen Elizabeth???? You would think Prince William would chose his mum name before the name of the Queen. no? William and his Grand Mother have a close bond. Elizabeth Diana in that order. Besides, it rolls of the tongue well in that order IMO. just an fyi ... May 6-May 12 is National Nurses Week. So, if you've ever been sick in the hospital- thank a nurse this week. I think having Diana at the end was a good call hopefully she won't be called little Diana. Joanna wrote: William and his Grand Mother have a close bond. PigPen wrote: just an fyi ... May 6-May 12 is National Nurses Week. So, if you've ever been sick in the hospital- thank a nurse this week. I'm predicting she'll be a rapper called L'il Charl.E.Dee. "You've been in the knife box today".....it's an old British saying. Lol. To my Brit friends big Election Day for you. Sounds like a close election. Piers Morgan says all the candidates are boring and no one candidate is a standout. What say you? Joanna, "You've been in the knife box today". I think I know what you mean but explain. What a funny saying. Donnamarie wrote: To my Brit friends big Election Day for you. Sounds like a close election. Piers Morgan says all the candidates are boring and no one candidate is a standout. What say you? and don't have the worries that the next generation or two may have regarding jobs. wittily to a remark. But mainly quickly ! Meaning they have a sharp brain today. It is Mother's Day here in the U.S wishing all mothers a happy Mother's Day. Re the elections in the UK. I'm glad they are over but am not happy about the landslide here in Scotland to the SNP. Have just discovered that the government is planning the abolition of the Human Rights Act. I'm shocked by this! It seems that they wanted to do this before but were stopped by the Liberal Democrats. Though I'm not a fan of Nichola Sturgeon (SNP leader) I'm pleased that she is opposing this plan now. I think a lot of Brits are unaware that our government are planning to abolish the Human Rights Act very soon. Hebe why does the government want to abolish the Human Rights Act? Another question. Will Scotland attempt again to separate from the UK? I'm not sure exactly why they want to abolish the Human Rights Act, Donnamarie. I'm not aware of them offering any discussion about it. They probably want to replace it with something else but I feel they need to bring it all out in the open and to listen to what people want. I think the SNP will attempt to get another Referendum re separation as that is what their ultimate aim is. The result of the Referendum in September was No but the SNP don't seem to be accepting this result. They may put it in their manifesto for next years Scottish elections. I'd like things to remain as they are, I like being British as well as Scottish and feel that there is a lot of ill feeling that was not there before. Thanks Hebe! Without looking it up I will assume the SNP is Scotland National Party? And is conservative? Donnamarie wrote: And is conservative? Conservative is the British equivalent to the Republicans - they're the ones who've just won the election here. Labour is the equivalent of the Democrats. The comparisons are vague because we have different needs and ways of thinking about politics compared to Americans, obviously, but in general Conservative is right wing and Labour is left wing. Ok, just thought I'd let you all know that I survived the zombie apocalypse yesterday. I don't usually have nightmares, but last night I was woken up by something at 3am while I was in the middle of a horrific nightmare about zombies attacking the inflatable cruise liner I was stealing with my ex boss (don't ask - it made perfect sense at the time). What was worse was, being woken up in the middle of the dream, I still felt like I was in it, so while my head was telling me it's ok, you're in bed and there aren't any zombies here, my heart was telling my head to go to hell, the zombies are definitely here and waiting for you. It took me about 30 minutes of quaking under my bedsheets before I got up the courage to go to the bathroom (silently and with the lights off because I sleep with the blinds open and any light would tell the zombies outside that I was there). It then took me another 20 minutes to build up the courage to go back into my bedroom in case the zombies had broken in while I was on the loo. The absolute worst thing is that a storm was approaching (I think this is what woke me up in the first place) so outside there were all sorts of unexplained bumps and bangs as the wind picked up. Horrible, horrible, horrible night. Oh Katie that sounds really horrid. something nice happens to you to cheer you up. Katie where was George when you needed him? Katiedot wrote: nightmare about zombies attacking the inflatable cruise liner I was stealing with my ex boss (don't ask - it made perfect sense at the time). Donnamarie wrote: Katie where was George when you needed him? Exactly! I'm going to send a complain letter to his PR agency. This is unacceptable! Ah, you lazy German you! Ever wondered what the true nationality of your soul is? Take this fun and awesome quiz to find out! A euphoric soul, you've touched the lives of many with the purest expression of the human spirit: humor, laughter, and love. You are full of bliss and it's contagious to anyone who's had the pleasure of knowing you. Joy runs deep through you, and your warm spirit can cheer anyone up. Your memories will forever create smiles! Does that mean I have to get one of those waxes? WhooHoo!! I'm Italian! I always wanted to be Italian. I fell in love with Italy when I spent time there after college. Unfortunately, I had to come home but now I know why I liked it so much. I have an Italian soul! You're the perfect example of kindness and human courtesy one could ever ask for. Empathy flows deep down into your bones. It is really who you are. You have cared for many and healed them with your touch, even at the cost of trusting others when they didn't deserve your trust. To be honest, your love and trust should be cherished and treasured. By being yourself and spreading your healing, you are creating a legacy of kindness and selflessness that will never be forgotten! And they should have damn well left it that way! in Canada where they don't get the snow ? Yes. The whole of Canada. (except the winter months). Maybe you could be a part-time Canadian? You know, hand your passport back to the authorities in September, pick it up again in May?